Having a large, diverse organizing team brings multiple viewpoints and talents to the effort. WordCamps are a lot of work, so starting early and having a substantial team go a long way toward shaping a successful event. For 2017 we had many more applicants than we could add to the team. We’ll let you know one way or another if you’re selected — and if not, there will still be opportunities to get involved as a speaker or a volunteer. 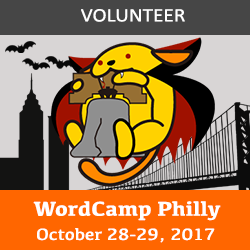 If you enjoyed WordCamp Philly 2017 and want to be a part of the team, now’s your chance. Sign up!